Ode to the days when a mother runs around like a chicken with her head cut off. For many mothers this is a common 'illness' that will bereft them during the holidays, but for a military mother whose son is headed home it is a different matter entirely. You can always tell when my brother is coming home because the house is suddenly impeccably clean, his room is put together with new sheets placed on the bed, and I am being yelled at to clean up my 'crap' in the bathroom... Our Marine is coming home and he has not been home for a year. It's interesting, the anticipation, as you await for that phone call from your Marine to come in at any minute declaring that his plane has landed. At first I was thinking I would remain at home and wait for him to walk through the door, but when my mom's phone rang I knew I had to go to that airport; there would be no holding myself back. I was in charge of driving to the airport. I was a little excited, but I was generally keeping my cool; that is until Ian came into view. 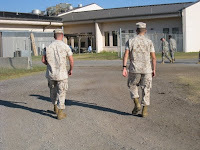 My brother, my Marine, my best friend was standing there just a short drive away within view. My heart started racing as I pulled up next to him, threw the car into park, swiftly opened the door and jumped (literally) into my brothers arms. (I was determined to beat my mother to him and I did so by a mile.) My brother was in my arms again. I still cannot get over it. You get used to saying goodbye after a while, but you can never get used to saying hello. The emotional relief that washes over you the second he is back in your arms is unbelievable. You were so busy going about your day-to-day life and so used to doing so with this emotional stress that you were able to back stock it in your emotional venue. However, the second they are back in your arms safe and sound, the release of all that tension is amazing and you suddenly are made aware of just how heavy the emotional burden you were bearing is. Sitting down and talking to my brother the first night he is back is always fun. However, this time he was explaining about how his team for his deployment to Afghanistan is the most stacked team and therefor they will be the team sent in to perform more solitary missions deep in the heart of the enemy. The dangers my brother will face send shivers down my spine. I have no idea how I will survive this deployment, but that is months away and for now my Marine is home. Music filled the house through guitar and piano once again. The sound of a song once created by an innocent high school band lover now flowed through the fingers of a strong well trained machine. There is no better way to describe a Marine than to describe them as a machine. However, they are Machines with hearts. When they come home they love their families and it is as if all of the metal is melted away to reveal the human underneath. When in battle, however, they are at full armor their heart encased within. He's home... I still cannot register it. Yet the smile on my face combined with the tears in my eyes tell me that this is the truth and my Marine truly is home safe and sound with his family. It is a Merry Christmas, Praise the Lord for my Marine is home. Airports… the hustle and bustle of people rushing to get to their gate on time; the nervous cluelessness of people as they go through security; the curiosity of children’s faces as their eyes take in everything that is the terminal; I love every bit about the airports and there is no place where I feel more at home. Growing up with a dad working for Northwest Airlines, we traveled a lot. Holidays were often spent with relatives elsewhere and once a year my dad would take me and my brother on separate trips to whatever location within the United States that we wished to travel. I was always fascinated by the terminal with my wide-eyed curiosity at everything that so much as looked like a plane, but my love for the terminal did not come until the more recent years when I began to travel on my own. fore going through security. I, however, enter the terminal with a sense of excitement running through my every fiber. I hop into line and look around at all the different people that surround me. My mind engulfs all that it can in the few precious moments as I stand there. Everything from military personnel to a small child running circles around their parents is in my view. The airport is the ultimate view of the middleclass American melting pot. I step up confidently to security to have my i.d. viewed and my boarding pass checked and marked off before making my way to the bins. It is fun to see unprepared people attempt to juggle all of their belongings as they dump change from their pockets and throw off their jackets and untie their shoes. In the mean time, my laptop is in my arms waiting to be placed in a bin. My shoes are already off, I have no metal on my person, and my jacket sits waiting with my shoes. They go through so much craziness and still have to have their bag checked because they forget to take their laptop out, or they have to be wand searched because they forgot the keys in their back pocket. As they or their luggage gets searched, I already have my shoes on, my laptop packed, my belongings secured, and am ready to start the rest of the adventure. carrying the child in comparison to the child’s carrier. The child is a redhead with the brightest blue eyes I have ever seen and, oh, what a smile this child has. She could most certainly steal the hearts of many. Oh she is crawling around and just being an adorable, explorative child. I think I have made a new friend. Nothing brightens up people waiting in an airport more than an adorable, smiling, explorative child. (Although, on the flip side, nothing puts them in a more sour mood than a crying infant on a plane.) My best wishes to my new friend as she explores the exciting world of airport and airplanes. The big looming question still sits in my mind as I scan the gate. Who will I sit next by? As a single passenger it is usually inevitable that I will sit by some a random person. (Child just sneezed into her blanket and looked up at her mother with a huge smile as if to say silly me, mommy, look at what I did.) It is always my favorite part of life itself to get to know that person. I have made lasting friends simply by sitting next to them on a plane. My first airport friend was named Cal. I was sitting in the airport in Detroit waiting for my connecting flight to go to Florida for my brother’s EOD graduation. I was missing a Packers game (I was a packers fan at the time because my boyfriend at the time was. Now, I have a mind of my own and am an ever faithful Vikings fan) He was watching the Packers game on the phone and I asked him how it was going. Conversation continued on from there and we ended up exchanging numbers and keeping in touch. We both travel a lot and I end up in the Detroit airport a lot (where he is from)and he ends up in the Minneapolis airport a lot, so we now both have another place to stay if we ever get stuck in a layover. We’ve had lunch a few times when he has been in the cities over the summer it is just good to know that I have a new friend from a random encounter. Another one that stuck with me was a guy named Jake. Oh Jake… how that guy made me laugh. I sat down next to Jake and, I don’t remember why, but soon after the plane was in the air he was making fun of me. We talked about everything. He did some work for some water company and had just finished a project in Marquette. I do not remember where I was flying to for this flight, but I was going to Detroit for a layover first. We walked to our next gate and waited for my plane to board together. I remember at one point he asked if this was going to be like in those chick flicks where the guy meets the girl and never sees her again and forgets to ask for her number. We exchanged numbers and stayed rather good friends after that, but we have sort of lost touch since. On my way to Haiti while flying to Miami I sat next to this one guy who was working towards being a Catholic priest. He was an interesting fellow to talk to. He was telling me to serve God and to go out in the world, but never really gave me a chance to tell him the irony of the fact that I was on my way to spend a week in Haiti. I wonder who I will meet on this flight. I am sitting in seat 1A for this flight, first class, oh boy. First class usually is lofty people who do not like to talk. I rarely end up making long terms friends with a person in first class, but, who knows, maybe I’ll be surprised this time! A little over a year ago I was in a relationship with a Marine. I used to think that being a military personnel's significant other was hard. Now that I am at both ends of the spectrum at once, being both in the military through ROTC (if one can count ROTC as military) and in a relationship with a soldier, I have found that I was right. When you are in the military you spend all day busy doing military things. Granted, there are many times when Command likes to play 'hurry up and wait,' but you are still busy with your military buddies. You may long for home you may be tired, sore, achy, and afraid, but you have your family at home. However, the whole perspective changes when you switch sides to those waiting at home. Those at home somehow have to deal with the stress of a job outside of the military, take care of the family, take care of themselves, and somehow still function while missing and worrying about their loved one constantly. You learn not to get hyped up for any upcoming promises or plans because, chances are, the military will end up taking them away from you and filling them in with some new mission. Every day that my brother or Carl was overseas I spent in the lounge at work pouring over the newspaper, praying I would find some good news about their unit while, at the same time, praying I would not hear of any horrors occurring in their area. We would sing a song in choir that so much as related to military in the least bit and I'd have to leave during class to hide the fact that I was about to cry. A song would come on the country radio station while I was driving home in the car and suddenly I would be crying so hard that I couldn't breathe. It's an emotional toll that military families have to pay over and over again. Letters. Letters are my sanity like none other. I think the vast majority of what little writing skills I have come from how many letters I have written over the years of my indirect involvement with the military. While he was in basic, my brothers letters were all that kept me going. This was partially due to the fact that they kept me busy while I tried to decipher his impossible handwriting for hours. I seem to have lost my train of thought so I am going to start again with a new mindset, sorry for the random jumping around this is just a topic that takes me over more than I notice. There are times when I can't even go to a movie, for example Brothers and not cry simply because the Marine in the movie is a POW in Afghanistan and my brother is going to Afghanistan in a month. The emotional stress that our service men and women feel upon returning home ends up being reflected onto their family members as well. After a return home, most soldiers end up distant from their family. They do not seem to care as much as they used to mostly because they have learned that they do not need to tap dance as much as they had been; life is too short to tap dance for people who won't love you unless you do. Civilians do not like it when people stop tap dancing for them. We like it when people will do anything to make us happy and when our soldiers come home exhausted from a deployment, having seen horrors we cannot even begin to imagine, and don't tap dance for us anymore we take it to heart. We only see how stressed we have been while they were gone and how it effected us. We cannot see past our own pain and our own hurt. This might contradict my earlier point about how it is more difficult to be the one at home, but I still stand by that point. A soldier has lived both as a civilian and a soldier. Most civilians have only experienced civilian life. Soldiers come home and their families cannot understand what they have gone through. They are being pushed away by their soldiers and unable to understand why. It is so difficult to have someone you have been waiting for and praying for for the past year just push you away and treat you like dirt and you don't understand why. It causes stress in homes and it causes stress in people. It hurts. 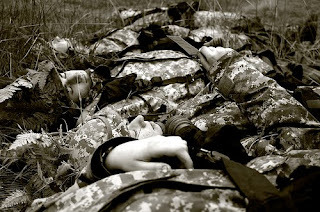 The worst part, to me, about being a military family member waiting at home is not the lack of communication, nor the stress, nor the tears; its the nightmares. I used to have nightmare upon nightmare and some days I would even be in class and just daydream (er...daymare) and there was nothing I could do about it. "How could something that is not reality effect you so much," you might wonder, but it is the idea that this is a nightmare that can actually happen that frightens families the most. I'll tell you my nightmare. Imagine: you are are sitting at home working or writing a letter to your soldier overseas. It is a rather normal day and you find yourself glancing at their picture multiple times as you work hoping and praying that they are safe. There is a knock at your door. You get out of your chair and walk to the front door. Peering through the window, you are able to see two soldiers. Already, the truth has sunk in. The door opens with your hand though you do not register that you are opening it as you blankly stare at the soldiers. You invite them in and you hear them tell you the news, but the details do not hit you right away. The soldiers give their condolences and walk out the door. You shut the door behind them then feel the lack of air fill your lungs as you crash to the floor in tears curled up in a ball as pain overcomes your entire body and nausea arises in your stomach. The words of the visiting soldiers play over and over in your head as you cry with your whole heart and soul to God. Killed in Combat. If you have ever been to a military funeral they are something you don't easily forget. The 21-gun salute, the draped flag over the coffin, the presentation of the flag to the family. The soldiers standing proud and true next to their fellow soldier, guarding and protecting each other even in death. Military funerals are a dark beauty to behold, though not something I would ever wish on anyone. There is nothing, however, like the military family. 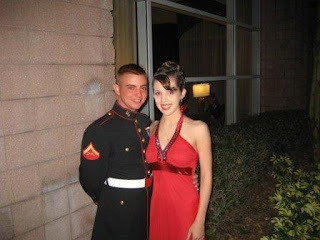 Only in the military family can you meet a complete stranger and within 5 hours you are already planning a way for them to pick you up from the airport and stay in a hotel with you for a few night so you can go to your loved one's homecoming or graduation and so you both can afford a place to stay. The military family is the most protective group I have ever met. If there's one thing that has effected me through my years of being in this family, it's the strength of these friendships. All the soldiers overseas are constantly in my thoughts and prayers. 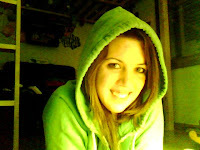 The breaking of my pseudo brother's or sister's heart from the loss of a loved one is like a shattering of my own heart. My heart goes out to all of those waiting at home and all of those whose heart is over seas. God bless our troops and their families at home.